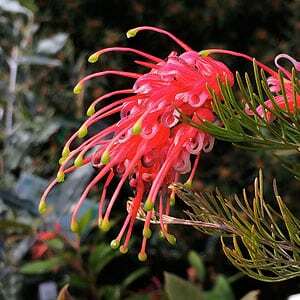 A medium sized shrub that thrives in a sunny position and a well drained soil Grevillea fililoba is commonly called Grevillea “Ellendale”. Excellent as a background shrub in the garden border or planted as a feature shrub. It is very free flowering and attracts nectar seeking birds to the garden. In a well drained soil is essential as is a position with good air flow. This his not a plant that tolerates humidity so sub tropical to tropical areas are problematical. Best lightly tip pruned after flowering to maintain a dense bushy habit. Flowering time – Winter to Spring and summer although in some climates almost year round. Foliage – Mid glossy green, narrow and segmented..